The Trick to this is to find out WHAT YOU LOVE TO DO? Is it drinks with friends to catch up? Is it discussions in your favourite book club? Is it going to the film and eating popcorn? All these activities are lovely but how do you find time to incorporate a Fitness Program into your free time? Maybe you are thinking it’s time to tackle your sedentary lifestyle? Or maybe you are wondering, how do I start a Fitness Lifestyle? Afterall, you will be so happy with all the benefits of exercise that you’ve heard about from doing so, but maybe you are not sure how. TIP-The first steps are the easy ones because they can be baby steps. Starting with small steps allows you to get used to the changes when trying to incorporate new movement habits and for some, small steps in the beginning is the only way to succeed. Only once have you successfully incorporated the small steps into your daily routine will there be room for the next small steps. After a while, when you look back you will see that you have, over the months, actually changed your lifestyle quite a bit. This is one of the ways I help my clients succeed. We work together to incorporate the changes. Some want a big change and can handle it while others need and should take smaller steps to incorporate new habits. So, how do you go about finding out what you love. Sit down and have a good think about how to move more with enjoyment. If it’s chatting with friends and loving coffee. Suggest to your friend a meeting point and walking together for 20 to 30 mins then stopping for that coffee or tea. The beach is a great way to do this 8 months out of the year and you have a choice of strandtents along the way! THE KEY to SUCCESS- Try to find something you love to do! For me it’s MTB Biking! Are you aware there are 100 parcours throughout The Netherlands?! I’m in nature…love it. I love the fitness training, and also the technical challenge of hills, downhills and manoevering over large tree roots and through sandy patches, and for me, little jumps are fine. I’m with friends….always nice right? and I know we will have a well earned cappacino or dutch pancake after our Sunday Morning Biking Meets. 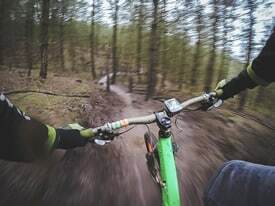 The best way to start out biking is to find a clinic that offers some technical trainings and from there you will find some like minded individuals to bike with or find out about biking groups. If you are starting out I suggest Capricorn MTB. Here is the link below and they give ongoing clinics in Den Haag. Vasta Sport has a one day clinic next Sunday, November, 11th and offers the basics and more, for the rider who wants a challenge. Maybe I see you there?! So…maybe biking is not your thing or perhaps you are new to sport and have never tried some group activities, but there are many out there such as – walking clubs, running clubs, badminton clubs and I’ve seen a club for chair dancing so any ability can start moving more! TIP- many people have not heard about the big new craze in The Netherlands and Internationally actually. Pickle Ball- a combination of tennis, ping pong and badminton. It’s great for all ages and I play when I can in Den Haag and Haarlem. Click on the link below to find out where to play and see the videos. You don’t have to be super athletic to play either so its a nice sport for beginners. Ok, I hope you are thinking about how to move more with enjoyment. You’ve got to love it, to do it more often! Jess Hills is a Personal Trainer in Den Haag.